The Dene Slope, a vibrant native meadow that features a trail with rustic seating and stunning views, is now open to the public. West of Billy Johnson Playground and just south of the Balto statue, the Dene Slope is a 1.25-acre area that was previously a weedy, eroded hillside. Now, it’s a growing meadow, peaceful rest stop for visitors, and hub for diverse wildlife. A meadow is a field populated with tall grasses and herbaceous plants. 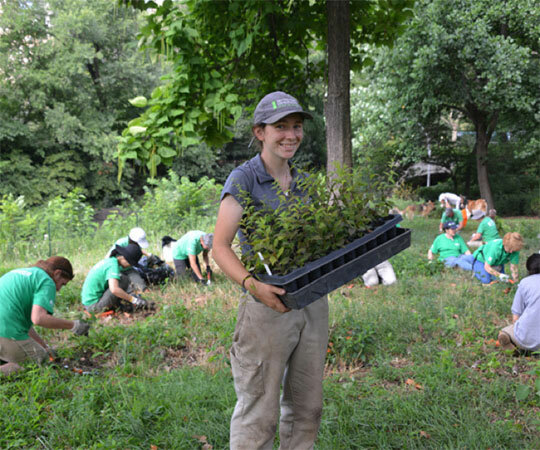 Though the first several years of creating a native meadow take a lot of work — primarily planting, weeding, and watering — they are quite low-maintenance once established. It takes three to five growing seasons to establish a meadow. Once established, tall meadow grasses prevent self-seeding invasive species from taking over, and they don’t require mowing. In these ways, native meadows can be less resource-intensive to maintain than lawns. The Dene Slope contains rocky, dry soil — not ideal as a picnicking lawn, and difficult to mow because of its steep terrain. Therefore, it provided the perfect spot for the Conservancy to introduce a native meadow, which can thrive in almost any environment. 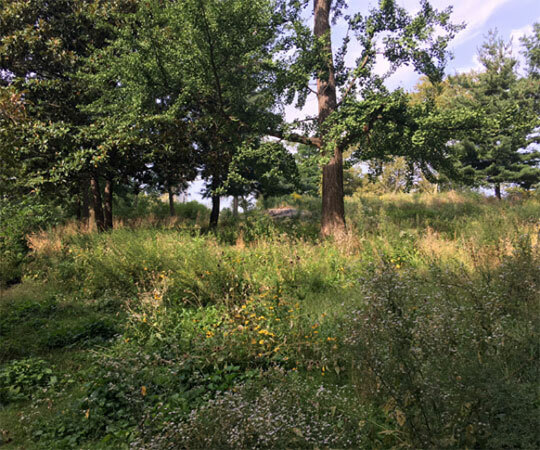 Although the North Meadow Butterfly Gardens also feature native grasses and plants, the Dene Slope is the largest meadow of its kind in Central Park. Now in its second growing season, the Dene Slope is showing a diverse variety of blooms. The Conservancy planted an abundance of native flowers in the meadow such as white false indigo, showy tick trefoil, common yarrow, lanceleaf coreopsis, hairy beardtongue, and button eryngo. Other native flowers that weren’t planted but have appeared include swamp milkweed, common boneset, cardinal flower, and blue vervain. This unique project allowed the Conservancy to not only create a vibrant destination for visitors, but to restore aspects of the Park’s character that had been lost over time. In fact, native meadows were a common feature in the Park as part of its original design. The Dene Slope now offers a peaceful area to relax in one of the busiest areas in the Park. In addition to a variety of grasses and wildflowers, the Dene Slope features a trail that leads to a rocky outcrop at the top of the hill and a rustic bench made by the Conservancy’s three-person rustic crew. The trail is accessible by wheelchair between the western entrance to the Dene Slope (near the East Drive at 66th Street) and the bench. The outcrop and bench provide views of the pastoral surroundings and Midtown’s skyscrapers. These blooms support the habitat by providing nourishment for pollinators, birds, and other wildlife. Mimi says she’s seen everything from mourning doves to monarch butterflies to hummingbirds in the meadow. She expects more birds to visit the Dene Slope during fall migration. The Dene Slope is open daily. Dogs must be on-leash at all times. This project was generously supported by Robert J. Katz and Arline Mann.